#1 - 4.64 - WEC 41: Brown vs. Faber 2. #2 - 4.42 - UFC 98: Evans vs. Machida. #3 - 4.30 - WEC 38: Varner vs. Cerrone. 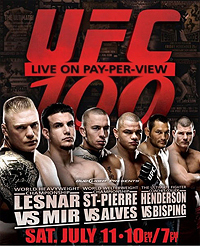 #4 - 4.30 - UFC 100: Lesnar vs. Mir 2. #5 - 4.26 - Strikeforce: Fedor vs Rogers. #6 - 4.25 - Affliction: Day of Reckoning. #7 - 4.24 - WEC 40: Torres vs. Mizugaki. #8 - 4.23 - Strikeforce: Shamrock vs. Diaz. #9 - 4.17 - Dream 11: Featherweight Grand Prix 2009 Final. #10 - 4.15 - UFC 107: Penn vs. Sanchez. UFC: Ultimate Fighter 9 Finale was bumped off the list by UFC 100: Lesnar vs. Mir 2. Dream 9 gets bumped from the top 10 event rankings by WEC 42, which enters at #9 with an average rating of 4 stars. enters the 2009 Event Rankings at #4 with 4.27 stars. falls off the top 10. Dream 11: Featherweight Grand Prix 2009 Final. entered the rankings with 4 stars tying WEC 42: Torres vs. Bowles. for the #10 spot. UFC 100 moves up from #5 with 4.23 stars to #4 with 4.3 stars. Strikeforce: Fedor vs Rogers enters at #5 with 4.26 stars. Affliction: Day of Reckoning move up from #7 with 4.18 stars to #6 with 4.25 stars. Dream 11: Featherweight Grand Prix 2009 Final moves up from #10 with 4.1 stars to #9 with 4.17 stars. FC 102: Couture vs. Nogueira drops from 4.16 stars to 3.93 stars, falling off the rankings.